Located just a short drive off Highway 17, St. Joseph Island is one of the Manitoulin chain of islands and one of the largest freshwater islands in the world. The Island has a rich cultural heritage and plenty to engage history buffs, who can visit Fort St. Joseph, the St. Joseph Island museum, and a small jail site c. 1900. For the cyclist, the Island boasts a 68km loop of well-paved roads and picturesque rolling countryside that have made the Island a popular cycling destination. Coffee lovers and those who enjoy celebrating their sweet tooth alike will be in for a literal treat as the Island is home to a both a prominent local fairtrade coffee roaster, and several maple syrup producers. Roughly 18% of all Ontario maple syrup is produced on the Island, making it a go-to destination for the annual Maple Syrup Festival in early April. The Island is home to four separate communities: the Townships of St. Joseph, Hilton and Jocelyn, and the Village of Hilton Beach. Two picturesque waterfront communities, the Village of Hilton Beach and Richards Landing connect directly to the Great Lakes Waterfront Trail. Both sites have all the amenities you desire. Charming places to stay, great food, paved roads, hiking, parks, gardens and plenty of beaches await you on this beautiful island getaway. The Village of Hilton Beach is home to one of the most picturesque marinas in the province and close to three different swimming beaches. With full-service accommodation and camping opportunities along with great places to eat, this village is a must stop. Richards Landing, located on the westerly side of the Island, is a beautiful waterfront community. Annual art shows, music festivals and the maple syrup festival are a few events worth planning your trip around. Camping and full-service accommodations, along with great places to shop and stroll are a great respite for the weary traveler. 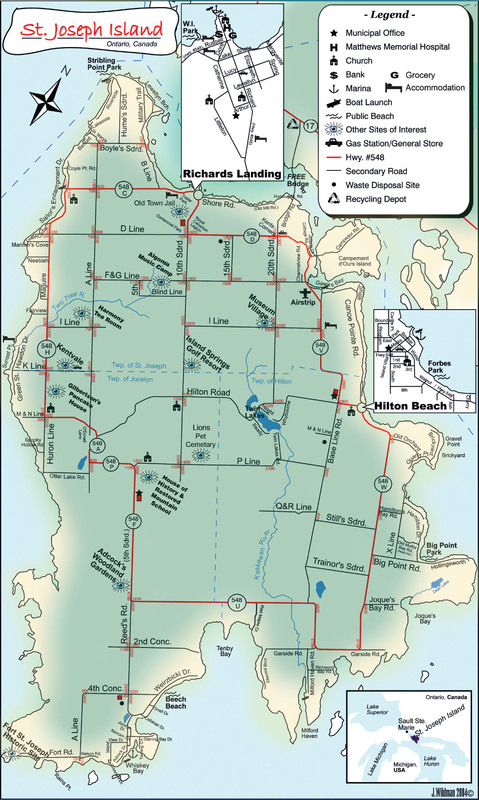 St. Joseph Island Cycle Routes Guide and Map (pdf). Wonderful two-page guide to great cycling routes on St. Joseph Island. Includes list of businesses, accommodations and attractions. Trans-Canada Trail (on the nearby North Shore) – The Trans-Canada Trail network stretches from the Atlantic Ocean to the Pacific and Arctic Oceans, forming the largest trail network in the world. The Lake Huron North Channel section of the Trail is designated as Trans-Canada Trail.